Unsolicited copy from Oxford University Press for review consideration! When Joe tells a local news reporter exactly what he would do if he were leader of the country, the video goes viral and Joe’s speech becomes famous all over the world! Before long, people are calling for the current leader to resign and give someone else a go …and that’s how an ordinary boy like Joe ended up with the most extraordinary job. Now the fun can really start …Hats for cats! Pet pigs for all! Banana shaped buses! Swimming pools on trains! A hilarious story of one boy’s meteoric rise to power! I was sent this book by Oxford University Press several months back and I thought I’d save it for May, to read in the run up to the General Election. It seemed rather fitting to publish this post today when many of us will be voting for the next Prime Minister. I don’t know how it’ll go, but I know for sure that it won’t be a twelve year old boy that’s running the UK! Can you imagine what it would be like if it was?! The Accidental Prime Minister tells the story of Joe, who unexpectedly goes viral after telling the Prime Minister exactly what he thinks of him and how the country should be run. Joe’s speech is videoed and is everywhere. Soon, the people are calling for Joe to be Prime Minister. The current leader resigns and Joe takes over. That’s when the fun really begins! 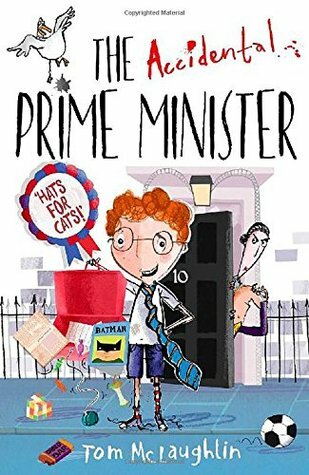 I think this book is a good introduction to politics and big decisions for children ages 7 years +. It was a really cute, easy to read, funny book which I can imagine myself reading with children at school. There’s a great deal of humour involved which will immediately appeal to children. I also love how the author has also illustrated the story as well as written it. I can certainly see this book being a hit in the classroom and beyond! A fun, light hearted read which gets a little silly at times, but it will definitely appeal to children! Let it be flour babies. Let chaos reign. When the annual school science fair comes round, Mr Cartwright’s class don’t get to work on the Soap Factory, the Maggot Farm or the Exploding Custard Tins. To their intense disgust they get the Flour Babies – sweet little six-pound bags of flour that must be cared for at all times. I vividly remember loving this book when I was younger. I was so happy when it was picked for our challenge, as I absolutely have fond memories of it. Whilst I still enjoyed it and thought it was a sweet read, I didn’t love it as much as I remembered. Ah. Adulthood! Flour Babies is about Simon Martin and his friends in 4C. They have a project of taking on the responsibility of a small sack of flour as part of a ‘Child Development’ project. The Flour Baby comes with many different rules and regulations! The aim of the project is to get the students to think about responsibility and parenthood. Our main protagonist Simon finds himself beginning to really care for his Flour Baby despite his initial reservations. Simon unexpectedly finds himself coming to terms with his own absent father. The absent father element is something that I didn’t recall from my childhood readings of Flour Babies. Perhaps because my father was absent (due to being in the army) so much, I didn’t really see it as anything unusual. 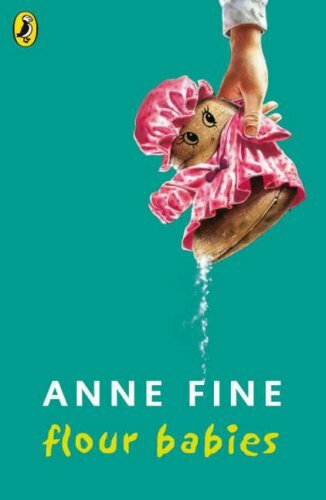 I really liked how Anne Fine didn’t shy away from the absent father in the story. So many children can relate to this! The language in Flour Babies is a little dated for our modern day children, but I do think children would still get something out of this book. Being from the education sector myself, I identified a lot with the school environment in which this book is set. Scarily enough, some of the teacher’s conversations about their students are accurate as to how some teachers (not me!) speak about their pupils! 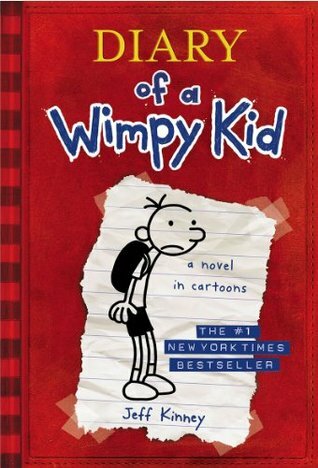 This book is so popular right now in schools, so when we decided to add some modern Kid Lit to our challenge, I immediately thought of this book. I can understand why it’s so popular with young children. I think it’s relatable to many children and I can imagine that many reluctant readers would enjoy this book which also uses cartoons! It’s an easy to read book which has some wonderfully humorous moments. Diary of A Wimpy Kid didn’t take me long to read at all. It’s in a short diary entry format, so for more relectuant or slower readers, it’s bite sized and easy to digest. I thought it was chatty and fun to read for young children. Greg writes about his life, family and school. I didn’t think he was a particularly likeable character, but that could be because this book isn’t aimed at me. I just found him to be a bad friend. I don’t know, perhaps this will improve with the series, but I don’t think it’s a series I will continue to read. I’m glad it’s on my radar to use with young children though. I know the children that have read this book are lapping up the series and I’m pleased it’s inspiring children to read. I think I vaguely remember being intrigued by this book when I was younger, but I never got around to reading it. Coupled with a university task and a desire to read more from Malorie Blackman, I was excited to get to this book. Pig Heart Boy is a particularly touching story about a very sick boy who takes the opportunity to have a pig’s heart transplanted into this body. Pig Heart Boy doesn’t take long to read at all yet it still makes a massive impact. I found it heart breaking but it was also an enjoyable reading experience. I think this is because it evokes so much thought in such a short space of time. It explores the dilemma of what risks you’d take if you were dying. It also could raise some ethical issues. Is it right to breed a pig in order to use its heart to keep a human alive? I loved the characters in this story. Cameron is a sweet, likeable character. I could totally understand his decision to go through with the operation. I wasn’t as keen on Cameron’s friend Marlon, but I won’t spoil it with why! I really liked that both parents were present in this book, despite their being some disagreements. Pig Heart Boy is well worth reading. It doesn’t take long to devour and it raises some important issues. I loved it. An enjoyable thought provoking read! I couldn’t wait to take a peek! In my warm and comfy bed. The verses swam round my head. Now, I’m not a poet. Cloud Busting was darker than I expected. I’m still thinking of it now. Malorie Blackman, take a bow! I will use this book in the future.